Bangladesh, Kenya and Zambia are three countries in the midst of extreme climate change. Through disaster risk reduction initiatives, Concern is working to reduce the impact of droughts, floods, and food scarcity in these vulnerable communities while also equipping them to be prepared for future disasters. Communities in Bangladesh, Kenya and Zambia are witnessing dramatic signs of climate change in their everyday lives. Concern is responding to the effects of climate change through disaster risk reduction initiatives that reduce the impact of hazards on the world’s poorest communities and make them less vulnerable to future disasters. The impact of floods, droughts and other natural disasters is likely to be most acute in the world’s poorest, least developed countries, including many of those in which Concern works. More than half of the deaths resulting from natural disasters occur in low-income countries. People in these countries experience signs of climate change on a daily basis: it has changed the way they live; it has forced them to move from their homes; it is killing their crops and livestock. 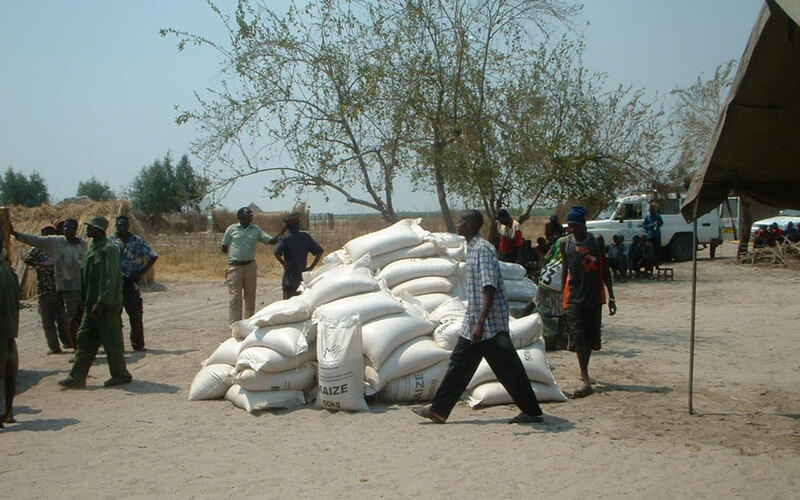 Villagers assembling bags of maize. Experts suggest that, over the next decade, environmental changes caused by global warming are likely to increase the vulnerability of poor people. In a number of African countries where Concern works, the regularity of drought is increasing the risk of both acute and chronic hunger. Soil fertility is a major problem in sub-Saharan Africa: 80 percent of farmland is affected by severe degradation, which is causing major nutrient loss and soil erosion. More than half of the deaths resulting from natural disasters occur in low-income countries. Many natural disasters are caused by inappropriate interventions or lack of interventions. Concern’s strategy is to assess environmental risk factors and “mainstream” disaster risk reduction (DRR) in all our future development programs. Concern’s DRR perspective is about planning to prevent poor people from becoming more vulnerable. Concern has talked with people in Bangladesh, Kenya and Zambia and documented their experiences. Although not a scientific or exhaustive study by any means, these stories nonetheless provide a valuable perspective on an evolving climate. The perspectives of these farmers, fishermen, mothers, reed weavers and pastoralists are that the climate has already started to change for the worst, and that the poor are finding it harder and harder to recover from more frequent cycles of drought and flooding. In the 1980s and 1990s, Lake Lutende in Zambia was a major tourist attraction. People from nearby Mongu Town and tourists from further afield used the lake for recreation. They would swim, ride speedboats and watch the many and varied species of bird. The lake directly benefited the local communities in the area and helped to bring in much-needed foreign currency through its international tourists. Women gather in their village. Experts suggest that, over the next decade, environmental changes caused by global warming are likely to increase the vulnerability of poor people. However, the new farming land gave way to further drought, “ When the natural lake dried up the huge reserves of the reeds also died away, the land also dried up and became incapable of supporting crops and grazing land. It became a completely dried area within a few years. ” As well as losing their source of income, the community had also lost its vital source of fish and its improvised farming land. 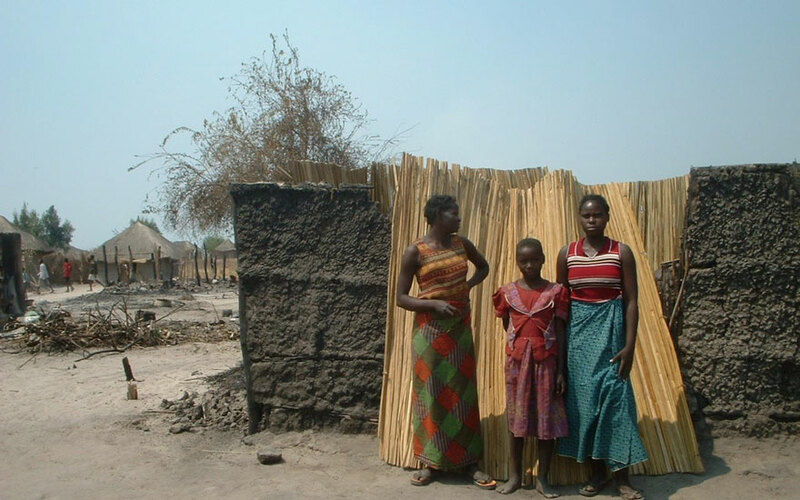 The impact on communities surrounding Lake Lutende was profound. Nyambe told Concern that most of the men in the area were skilled in reed mat weaving and they felt they could not abandon their skill. They began making the long trek to the Zambezi plains where reeds are still found. This was fine for the younger men, but the older men didn’t have the energy to make the long return journey. The women tried to generate an income by brewing and selling a traditional beer called “sipesu”. Other people have resorted to selling wooden poles and thatching grass. Communities in Kenya have also been disrupted by the effects of climate change and drought. Habiba Mohamed Adan lived in Moyale, Kenya for most of her life. 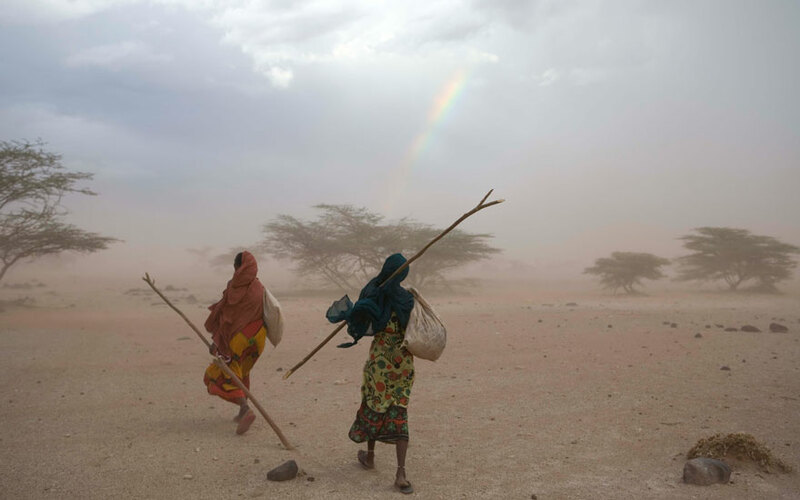 But like many other people who depended on their livestock for their livelihood, she and her family were forced to move in search of pastures and water when Moyale suffered the effects of drought. In 1991, Habiba Mohamed Adan and her family decided to settle permanently in Yaballo. They lost most of their livestock to drought and were left with only 10 of their original herd of 70 cattle. When they settled in Yaballo, they sold the 10 cattle and bought four camels to enhance their chances of survival. Women in rural Kenyan communities are usually responsible for feeding the family as well as for collecting and managing water. The current crisis has arguably hit them the hardest because the droughts have made finding and transporting water much more difficult and time-consuming. There are also anecdotal reports that more women are being forced to seek employment away from home in order feed their families. With the men travelling further from their villages to look for pasture for livestock, the women and girls left behind are more vulnerable. With a population of 150 million, Bangladesh is the world’s most densely populated country. It is also one of the countries in which the signs of climate change are most dramatic and obvious. At the present rate of flooding and erosion, it is estimated that 20 percent of the country could be underwater by the year 2100. Concern works with vulnerable communities in Bangladesh to reduce the scale, impact and frequency of future floods and cyclones—and to enhance their capacity to respond to and recover from them. Some of these communities are on the tiny island of Aralia in the northeastern Haor flood plain. Home to nearly 4,000 people, it has been diminished under rising waters over the last 50 years, and it is now only one fifth of its former size. Flooding has become more frequent, temperatures have increased, and disease kills four people per month. Alaha, a 40-year-old widowed mother of five, earns $7 or so a month as a caretaker on a tree project—a job she found through a women’s group supported by Concern. She was devastated when her best friend was swept away by floods in 2004. “ People on this island have to face these kinds of things all the time, ” she says. At the present rate of flooding and erosion, it is estimated that 20 percent of the country could be underwater by the year 2100. Concern is working in Kenya, Zambia and Bangladesh to make the poorest communities less vulnerable to natural disasters and the effects of climate change. In Kenya, Concern is working in four districts hardest hit by drought, namely Marsabit, Moyale, Malindi and Kajiado. Concern has distributed emergency food rations, and is providing communities with clean, safe water through the construction of boreholes and other water systems. Concern also assisted people who had lost their livestock by giving them new animals including bulls, heifers, goats, sheep and donkeys. Concern also distributed seeds to small farmers who had lost their crops during the 2005–2006 drought, which was followed by severe floods. In Zambia, Concern has been working with the District Disaster Management Committee on a long-term project to establish plans and responses for future emergencies. One such project is our canal-clearing activities. This is vitally important as it protects the local communities from flooding and provides water for agricultural production. For the last three years, Concern has been helping communities clear their canals, which reduces their vulnerability to floods, protects their assets and helps increase the productivity of their land. Concern has distributed emergency food rations, and is providing communities with clean, safe water through the construction of boreholes and other water systems. In Bangladesh, Concern aims to benefit over one million people with its disaster reduction work. We are helping the northeastern Haor communities reduce the impact of floods through disaster contingency planning a well as by introducing wave protection measures and building “raised” refuges. Concern is also helping communities in Haor by planting new trees to prevent further soil erosion. Valuable work is also being done in partnership with local communities. Working through its partner Shushilan, Concern has been helping to promote sustainable and environment-friendly agricultural and fishery practices. Forestation projects are underway, as are programs to raise awareness of environmental issues and to help local communities prepare for future disasters. As the rate of climate changes continues to increase, natural disasters may also become more frequent for people in Bangladesh, Zambia, Kenya and other poor countries. For them, the threat of climate change does not appear distant: it is a source of chaos threatening their everyday lives. Concern’s disaster risk reduction work will enable the poorest communities to respond to and recover from these threats more effectively.